“ntop is a network probe that shows the network usage”, this is the brief description of ntop extracted from the official ‘overview’ page of www.ntop.org. the reason why I like ntop is that it gives us a immediate projection of what is happening in our network NOW! with graphical and table representations of the current, recent and past network statistics. but as always happens the easiest way is not the best way, in facts the MacPort version of ntop is 3.3, quite old respect the current stable version 4.0.3. Also, the installation of ntop through the port tool doesn’t install and configure it as a service but only as a tool to be run occasionally. Another reason to manually install ntop and follow the procedure below is to install and configure it as a daemon (LaunchDaemon) launched by ‘launchd’. What will will do then, is to download, compile and install the ntop 4.0.3 directly from its official website and rely on MacPorts to install it’s compiling and installing dependencies. The -latest- sources of ntop. Xcode (required by MacPorts), you can install it from Mac OS X Server Snow Leopard installation disk, ‘Optional Installs’ folder. Workgroup Manager, it’s part of the Server Admin Tools and needs to be downloaded from Apple support and installed, unless you are running Mac OS X Server. MacPorts, you can download and install it from www.macports.org. Make sure you have installed Xcode and MacPorts and Worgroup Manager. this command do not istall ntop from MacPorts but only its dependencies. This step could take several minutes because it will download, compile and install a lot of ports (libraries). Leave the password blank prevent any possibility of login and also do not specify the home folder, of if you really need to specify one choose /usr/local/etc/ntop. This procedure can be executed in command-line as well using the ‘dscl’ command, but you will have to assign the Primary User ID manually retrieving it from the directory service using other scripts. 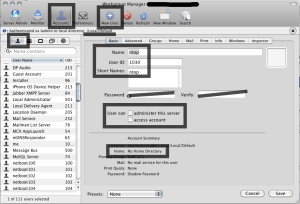 The Workgroup Manager calculate the first available User ID automatically. # Configures ntop not to trust MAC addrs. #  NOTE: The = is REQUIRED and no spaces are permitted. # Sets the networks that ntop should consider as local. # NOTE: Uses dotted decimal and CIDR notation. # local and don't need to be specified. # ntop should be able to determine this automatically. Set the correct file and folder permissions. VERY IMPORTANT! If you found this how-to useful, please leave a feedback, it will be really appreciated. This entry was posted on Sunday, January 16th, 2011 at 02:15 and is filed under Apple & Mac, How-To. You can follow any responses to this entry through the RSS 2.0 feed. You can leave a response, or trackback from your own site. * wget is not installed on Snow Leopard. You have to install it yourself with for instance MacPorts. *during the sudo port install depof:ntop the isntallations fails on unmet dependancies about 4 or 5 times. Your mileage may vary. these dependency errors can be easily solved by manually installing the first missing dependency with sudo port install. Ghostscript refused to install untill I did a port clean gohstscript. * Workgroup Manager needs to be downloaded from Apple support and installed, unless you have an Xserve or OS X server version. * ./autogen.sh needed a ./configure before it completed. And then the big moment: Yes, it works! I really appreciate your detailed review of my post. I’ll revise and fix it as soon as possible. * Actually ./autogen.sh runs itself the ./configure script (at least did so in my systems). * I would not place the script in /System/Library/LaunchDeamons/ because that folder is reserved by daemon scripts installed with Mac OS X. * I would not place the script in the user’s Library folder because the daemon would launch only at the user’s login. * Instead /Library/LaunchDeamons/ is meant for third party’s scripts. It’s just a matter of ‘good practice’. Thanks. This was a big time saver for me. Also, I think wget is one of the dependencies installed in step 4. If so, switching steps 3 & 4 might resolve Peter's related comment. I'll leave the details to smarter people. I updated the post according to your fixes! *>>> No way to proceed. what you’re missing are the headers for the gdbm libraries, you need them for the compilatin, you don’t need the binaries. You probaly need to install the ports called: gdbm and py25-gdbm (alternatively py-gdbm). I don’t have my server with me know to double check what I’m writing here, but I believe the configuration is looking the libraries in the “wrong” directory. You could pass parameters to the config to link the right directory, or create a symbolic link to the libraries with the path requested (inspect the config.sh). This describes how to install ntop on Server Snow Leopard, but does it also apply to non-Server SL? I have X.6.5 on a stand-alone, and only access the Internet for email and occasional information/downloads, but want to know why there’s sometimes traffic I didn’t initiate or authorize. I’d like to know who is on the other end and what they’re doing. Is ntop the best app for this limited purpose? Thanks. yes, but check the other comments, as for the non Server version you may need to install some tool manually. the –daemon switch, what is it’s purpose? Launchd handles daemonization, it is explicitly stated that programs are not to daemonize… ? could you please point me to the point where it state that, I couldn’t find it! Have you tried to run the script without the “–daemon” switch? I have to the chance now. I’ll try myself asap. Daemons or agents managed by launchd are expected to behave certain ways. have the parent process exit(3) or _exit(2). o Setup the user ID or group ID. o Setup the working directory. o Close "stray" file descriptors. o Change stdio(3) to /dev/null. o Setup resource limits with setrusage(2). o Setup priority with setpriority(2). o Ignore the SIGTERM signal. I followed all the steps and installed ntop 4 on my MBP running snow leopard 10.6.7. This is just the standard snow leopard, not server. Installing Xcode (4.0.2) took forever as well as the dependencies for ntop, but no errors to speak of. Seems to be stable so far too, no crashes yet. I will push netflow data from a Cisco ASA into it tomorrow so I can see what the users do and perhaps catch why there is a recent outbreak of malware and how it comes in. Will also come in handy with the IPv6 testing as Ntop 4 catches that traffic as well. The maps are neat, haven’t seen those before as I used ntop 3 before. Thanks for writing up this tutorial, wouldn’t have been able to do it without. I installed ntop per your excellent guide. Mac Mini, 10.6.7, 2G RAM, latest Xcode DevTools installed. This is an excellent step by step HowTo. That was a good idea using Macports to get all the dependencies. I managed to get it all compiled! However, I don’t understand why you want us to make this ntop user. Greetings. Thanks for the help thus far. What can I do to resolve this? I ran the sudo chmod 644 command on that file – so the permissions should be correct…. As far as the POSIX permissions go on the file the local admin user has read/write, the staff group has read only and everyone has read only. Would this be correct? Marco excellent How To! Thank you for your time on this. Thanks Ugo, I’ll update the post using your tip! Your guide was perfect to setup NTOP on my IMAC. The only difficult was with launchctl, but after remove the first and the last line everything work like a charm. First of all many thanks for an excellent writeup. Worked out of the box where I had before spent hours fiddling with macports and/or xcode. One small caveat: there is just NO WAY i can get the EditPref page to let me set dot.path to /opt/local/bin. Type values, click add, page refreshes and its gone again. Any ideas? I am running in daemon mode from launchctl? did you try to edit it with a basic text editor like MacVim or vim or nano from command line? Hello MAC, I’m using MAC OS Lion and I’m stock with autogen.sh. I have Wget install via MAC port but still got this error message. I will appreciate your help. You must have wget installed to compile autogen.sh. then create a symbolic link with ‘ln -s’ from the actual path of wget to the path that the script is expeting wget to be. I finally got it working. For my autogen.sh I comment the part related to Wget and the script run without error. I find out that I was running Fink and Mac port. Fink was installed when I use the transfer wizard from my old mac to the new one. Thanks again for your help and your tutorial. WOW! This install was out of my league! Now I just need to understand the stats! A BIG THANK YOU & You are Awesome MarcoMC!! This web site needs a different Google Maps API key. A new key can be generated at http://code.google.com/apis/maps/signup.html. Went thru the instructions on Mac OS X 10.7.1. I didn’t follow the ‘wget’ portion of the instructions verbatim and dl’d as a regular user through a browser. After un-tar’ing with a regular user account but running ‘make’ as root the difference in file permissions caused ‘libtool’ version errors. Argh! Deleted the ntop subdirectory, untar’ed as root using ntop-4.1.0 as ‘Wireless Woody’ did above. Re-ran ‘autoconfig’, ‘make’, et al successfully. I can browse to ntop. Sweet! Thanks muchly Marco! Absolutely great instructions. setting the path for “dot.path” didn’t take until I messed around a bit ..
no need to restart this time ..
Or is some functionality missing if it’s not run as a daemon? This is a network monitoring tool that gives you information about the network activity for you to understand if there is something unusual and what is causing the anomaly if it’s the case. That means that it need to collect data to to create graphs for you to understand what is the usual (‘normal’) condition for then understanding and detecting whether something wrong is going on now or is something wrong went wrong in a specific moment or if something is going wrong chronically with a periodicity. My point of view is that this help me understand the behaviour and common patterns of my network. If I run it just when I notice that ‘the internet is slow’ it maybe will just help me to understand if currently there’s somebody saturating the bandwidth with some p2p connection… no more that this. You usually create a specific user ‘ntop’ (via System Preferences on stand alone machines) to prevent possible cracking of the server. If you don’t run it as a daemon make sure you run it with sudo or directly as room, in that case you most probably do not need to create a user ‘ntop’. Thanks for this wonderful guide, Marco! thanks heaps for this tutorial. Got it working on Snow Leopard, both server and client versions. I am trying to install on 10.7.4 and I get the following error when running the autogen.sh script. This is from a svn install, not the stable tarball. 2. Preparing for libtool …. glibtoolize: putting auxiliary files in AC_CONFIG_AUX_DIR, `.’. glibtoolize: putting macros in AC_CONFIG_MACRO_DIR, `m4′. …. not found – aborting! make: *** No rule to make target `libtool.m4.in’, needed by `acinclude.m4′. Stop. I have the same problem at the ./autogen.sh stage. There are a few minor errors – most significant seems to be about having an old version of Python? Do you think it is permissions problem, or should I try the install with an earlier version? what is the error output? First time install of ntop. I’m trying it first with latest stable ntop-5.0. Snow Leopard Server 10.6.8 with fresh install of Xcode and MacPorts. Did you try to verify if ./nDPI/src/include is actually a file or a directory? or if is there for real or not? If you run a quick search on google, you are not the only one experiencing the problem. I reviewed the ntop-5.0 directory in ~/src. Yes, there is no nDPI sub-directory in ntop-5.0. There is a file instead. Where, when is nDPI/src/include directory created? I notice now that you refer the NTOP 5, that is the developer version, not the stable.I haven’t tried it yet so I cannot be of any help. Much Much Sorry! So I downloaded via svn nDPI and replaced the nDPI file in ntop-5.0 with the new nDPI directory. Then reran autogen but received libtool fatal configuration error. I’m guessing this is beyond the scope of this blog post. But any direction is greatly appreciated. Fatal configuration error. See the libtool docs for more information. After searching for ltconfig answers I gave up on nDPI and ntop 5 and installed ntop-4. It is running. But when in the web interface I go to admin to config preferences I’m prompted for username and password. Nothing works. I followed the Workgroup example of creating ntop group and ntop user. Check the Configuration part of my tutorial. there is a command to set the dabase password that is owned by the user ntop. That would set the password that you use to access the web UI of NTOP. The user password and the database password for ‘ntop’ are two distinct things. I did get nDPI installed separately and moved it to proper location and then nTOP 5 installed. But then the nTOP webserver would crash on launch. That was last week. Haven’t done anything since. Going to uninstall everything and start fresh. already tried with creating symlinks in /usr/local/lib/ntop for the html durectory located in /usr/local/share/ntop/html with no success . Also everything related to ntop is ch-owned to ntop:ntop user …. I’m honest with you, it’s ages since I haven’t installed ntop again, so this post is the only memory I have about the installation. By the way as you are not running is a daemon you probably have not set the plist files. also, in the post I do not mention in any place the location ‘/usr/local/share/ntop/html’. I’m not sure this is where you have to expect that the ntop GUI is sourced from… (Just I don’t have any memory about it, I may be wrong). If you try to run is as daemon, would it work? Workgroup manager cant be installed in 10.10.3, so this workflow isn’t great for everyone. would love to get some free ntop software going in osx. 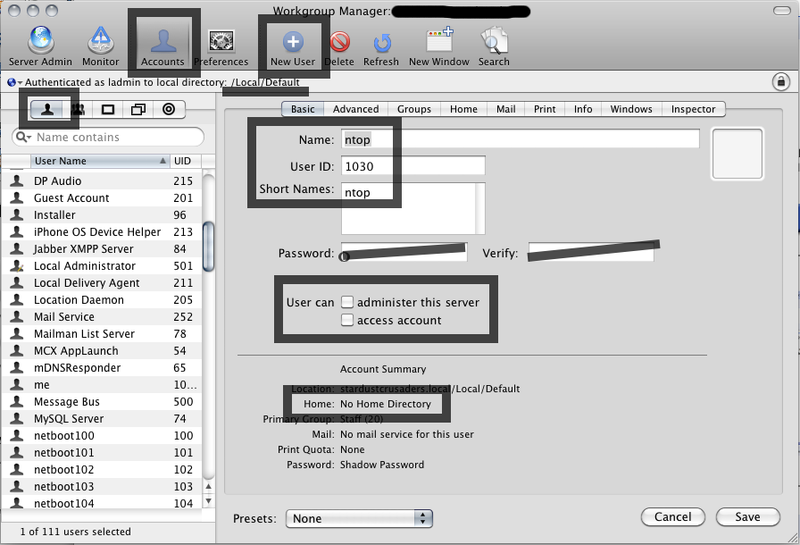 ntopng is bogus, it requires a paid for dependency – nprobe to work in osx with netflow. currently I dont know any neat gui solutions for network monitoring in osx.